Playlist Animations allow animated transitions to take place when templates switch from one to another. 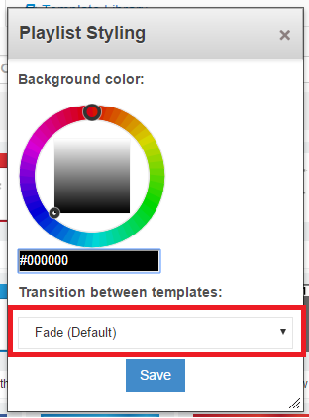 The background color allows you to change the color of the screen during transitions. How do I implement Playlist Animations? 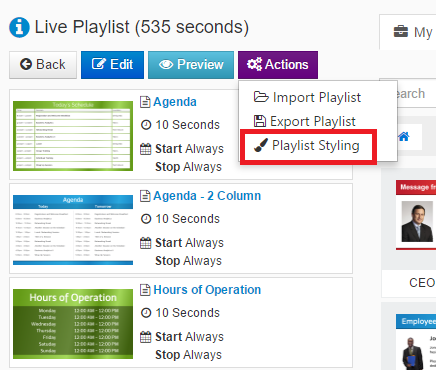 Step 1: In your “Live Playlist” area, click the purple “Actions” button and click on “Playlist Styling”. Step 2: The Playlist Styling box will appear. 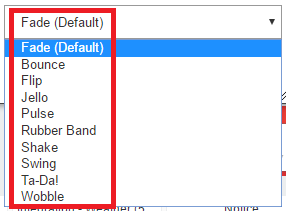 Click on the drop down menu under “Transition between templates” to select from a variety of animations. Step 3: Select an animation and click “Save”. Step 4: Enjoy your new animations!